About 3 years ago, I’d become curious with the phrase ‘Life Hacking’. My life is pretty full, what with nearly 4 kids, daily blog, weekly radio show, plethora of projects, hobbies and activities, and it became apparent that there was a whole culture out there of people working out ways of getting things done. I’ve tried several systems to help me be more productive, less forgetful, free up more time to do more stuff. I was a big fan of a system called Remember The Milk, based on a system called Getting Things Done for instance, but, found that the maintenance of this system was in itself, quite hard work. I’d found myself subconsciously or otherwise, avoiding the regular discipline it takes to, well, remember the milk whilst getting things done. I think procrastination had something to do with it. Procrastination was until recently, something I’d thought of as a bad thing. Turns out, it’s actually quite a good thing. Like with most things, there’s a time and a place for it. When I’m in need of getting a job out the door – particularly one I don’t especially like, the Procrastination Elf makes himself known. He sits on my shoulder, probably picking his nose, and suggests a quick look at something else. Just a teensy weensy look. I’ve got a couple of weapons against Procrastination Elf. I highly regard the Pomodoro technique for instance – an especially handy tool for tasks that are likely to take half an hour to a day to complete. A system whereby I break a task down and say – this is going to take me two hours, and I’ll allow, nay force myself exactly 5 minutes break after 25 minutes. Repeat 4 times, take 15 minute break then start again. If you do find yourself dancing to Procrastination Elf’s fiddle whilst on a pomodoro, you have to start that time block again. I now often estimate tasks in blocks of pomodoro. I’ll look at a task and think of it as a one pom, or a three pom, and so on. I’ve got quite good at it, and the only thing I allow myself to be distracted with is putting on some different music. That’s one of the main reasons why I like this utterly simple to operate desk based time management system called Final Version, devised by Time Management guru, Mark Forster. It’s a tasks list system where Procrastination Elf doesn’t seem to prevent the maintenance of said system, furthermore, he’s got his own parking space. The system is basically – write down EVERYTHING you have to do. Put a dot next to the first item on the list, then, whatever item is next, ask yourself; do I want to this before I do the item with the dot? It’s basically asking for a yes/no judgement call – the urgency, importance, instinct and psychological readiness to do said task. If the answer is yes, put a dot next to that. Repeat until end of list, then (and here’s the clever bit) start at the bottom of the list and do the first task with a dot you come do as you scan UP the list. At any point, if Procrastination Elf wades in, picking his nose, telling you to check twitter, write “check twitter” on your list. It’s pretty much as simple as that, but there’s a whole page of Final Version Instruction here. Draw a line through each done task and overshoot the line into the margin, through the dot. Vertically bridge the gap in the margin between stacked done tasks (as pictured). That way you can rapidly scan a block, and know it’s all done. Draw a big circle at the top right corner of the oldest active page – that is the page with the oldest, yet-to-be-done task. When the whole page is complete, draw a cross through the circle and draw a fresh circle on the next page. That way, you’ll know you can effectively ignore – even rip out and burn if you like, that page and every page prior. Don’t get hung up on old tasks. Write it again – at the bottom of the list and try to break it down to the very first part of that task. Eg instead of ‘invent wheel’ write down ‘think about inventing wheel’ or ‘start inventing wheel’, and cross out the old one. Have a dedicated note book. A4. Hardback, lined with margins. A the moment, I’ve got it as strictly a desk-at-work based system, whereas things like RTM were my whole life system for a while. I’m still tentatively seeing how FV goes – I’ve been using it for just over a month now, and it’s settled into being a very good system. Unobtrusive, instinctive and fast. Now.. what should I be doing next?… Oh Hi Elf! I am continuously hounded by The Procrastination Elf…he/she clearly gets about…or do we each have our own special one, finely tuned to our individual personalities or state of mind? 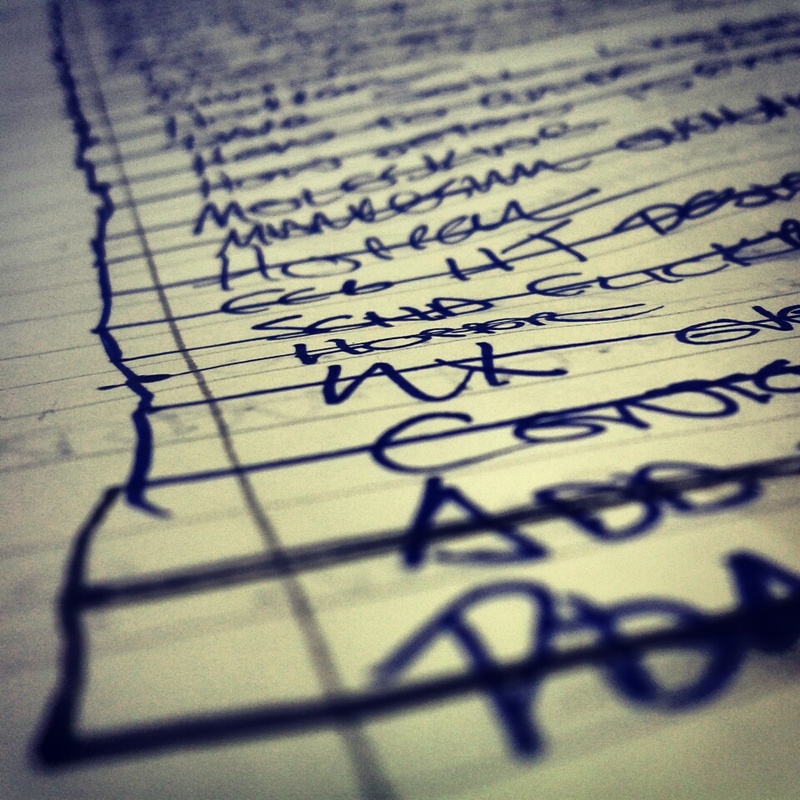 Lists are a great help, except that I get depressed when there are still things left uncrossed after the deadline I’ve set mysElf has been and gone…!